I showed this new book from Faber Music to one of my teenage students and she exclaimed “Wow! That’s so cool!”. She told me she liked the design, the selection of pieces and above all the illustrations which one can choose to colour in between practise sessions. Mindfulness, a simple practice of meditation which encourages one to be “in the present moment”, to banish negative thoughts and alleviate stress and anxiety, is now very popular. Mindfulness has been shown to help people suffering from stress, anxiety and depression, including physical manifestations of stress disorders such as eczema and psoriasis, pain and ill health, and is approved by the UK Mental Health Foundation. It has significant a role in music making and performance, and its benefits have been recognised by practitioners, teachers and musicians – so much so that the Guildhall School of Music and Drama now runs courses on mindfulness for performers. Adopting a “mindful” approach while engaged in music practise can lead to an increased awareness and help us reconnect with our instrument and our musical self, leading to improved concentration, physical awareness of the feel of the instrument under the fingers, tone control, quality of sound, expression, a vibrant dynamic palette, flow, musical insight and communication. The simplicity of this piece allows you to give all your attention to the sounds you’re creating. Focus on the hypnotic patterns, harmony and chord changes and if you notice your mind wandering bring your attention back to the music. 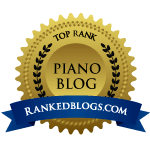 Of course, students and pianists of all levels should ideally engage in mindful piano playing at all times, but the mind does have a tendency to wander, and the text at the beginning of each piece provides a useful focus. Teachers can work together with students on aspects such as technique, dynamics, articulation and expression. The book is attractively-designed with an eye-catching treble-clef design on the front cover. A CD of the music might be a useful addition in a subsequent edition, but overall there is much to enjoy in this new collection, and I think it will have a particular appeal for teenage students.